Sherlock Holmes enters his drawing room to find it being burgled, but on confronting the villain is surprised when the latter disappears. Holmes initially attempts to ignore the event by lighting a cigar, but upon the thief’s reappearance, Holmes tries to reclaim the sack of stolen goods, drawing a pistol from his dressing gown pocket and firing it at the intruder, who disappears. After Holmes recovers his property, the bag vanishes from his hand into that of the thief, who promptly disappears through a window. 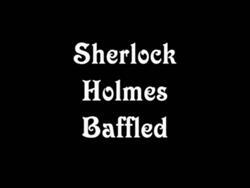 At this point the movie ends abruptly with Holmes looking “baffled”. The earliest known film featuring Sherlock Holmes was produced for showing in Mutoscope machines in amusement arcades. Running time: 30 seconds. The production date was 26th April 1900.